Dear Friends , As you all knows result for the Interview Held for IBPS PO IV (4) is Near and You all are thinking how much chances you have in this time IBPS PO 4 . So we are sharing Bank-wise Vacancy details for you. This data is sourced from Reliable Sources. There is probability of 4-5% variation in above mentioned table. About 48000 candidates called for interviews. Vacancy to candidate ratio is 1:2. 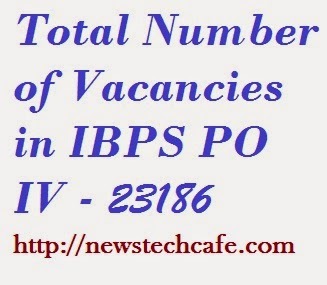 Expected number of vacancies in IBPS PO IV. There is a possibility of 1 mark variation from the above marks. It's almost impossible to calculate ST cutoff. As it will be anything below 40. Making a wrong calculation will be a bad thing so I am not calculating anything for ST candidates. i dont think cuttoff for general in ibps po will be such a high.it will around 45.as ratio 1:2.n more vacancies are there than previous.students will also opt for various exams such as SBI PO,sbi clerk,sbi asso. po,sbi asso. clerk,RBI,UIICL,NICL etc etc.dont u think such high cuttoff will place lesser vacancies this time.